A Vintage (1970’s) Lower Sackville Comic. Hahaha what? | Sack-Vegas!!!! A Vintage (1970’s) Lower Sackville Comic. Hahaha what? I just stumbled across this Ebay ad on Twitter. 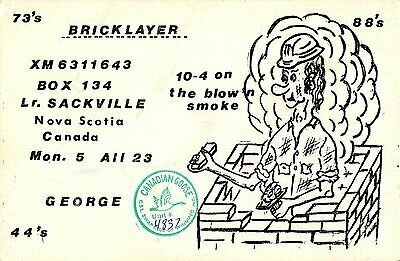 It seems to be a postcard of some sort with a cartoon ad on it for bricklaying. Looks like it has a Cape Breton connection so maybe it was a job ad sent up that way. This was when Sackville had a ton of construction going on. Hilarious! “10-4 On The Blow’n Smoke” What?? No workplace safety here! Please share this around and maybe someone will remember something about it. Now excuse me as I must go bid…. Posted by Sacky on November 25, 2013 in Burning questions!.